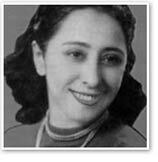 One of the most influential of all Arab women writers, Nazik al-Mala'ka was born in 1922 to a cultured Baghdad family. Her mother was a poet (writing under the name of Omm Nizar Al-Mala'ka) and her father a teacher as well as the editor of a 20-volume encyclopedia. Al-Mala'ka began writing as a child, composing her first classical Arabic poetry at the age of ten. She was educated at the Higher Teachers' Training College in Baghdad, publishing poems while in college in several newspapers and magazines. She studied in the department of Fine Arts and attended classes in acting. Her knowledge of English brought her to Princeton University on a scholarship. In 1954 she continued her studies at the University of Wisconsin, receiving a M.A. in literature, working for several years as a university lecturer and professor. In 1961 she married Abdel-Hadi Mahbouba, a former colleague in the Arabic department at the College in Bagdad. With her husband al-Mala'ka helped to found the University of Basra in southern Iraq before beginning to teach for a number of years at the University of Kuwait. In 1990 she was forced to return to Iraq by Saddam's invasion, but fled the country to Cairo, avoiding publicity for many years. In 1999 she reentered the literary scene with a new book of poetry, Youghiyar Alouanah Al-Bahr, which also contained an autobiographical sketch. Al-Mala'ka's first book, A'shiqat Al-Layl, appeared in 1947, expressing themes of despair and disillusion traditionally in Arabic literary romanticism of the 1930s and 1940. Her second collection, however, Shazaya wa ramad (Ashes and Shrapnel) was written in free verse, and helped to bring about a new avant-garde in Arab poetry. Throughout the 1950s, al-Mala'ka was among the most prominent figures of modernism, writing numerous articles on metrics and taking strong positions as a defender of women's rights, as well as lecturing on women's position in a patriarchal society. Her collected essays, Qadaya 'l-shi'r al-mu'asir was published in 1962. Her later poetry distanced her from her early experimentalism as she developed more moralistic and conservative views, expressed in outwardly religious poems. Al-Mala'ka died of the effects of Parkinson's Disease in 2007. A visitor who never came. Both of us, our eyes turning, still in search? My hands would hold the fragments of my innocent hope. The panacea for the wounds of man. We wanted it, but didn't get it. Back to our hopes, miserable and unfulfilled. And a dream of flame. Of exhausted victims are screaming.